I love trying new protein bars. I love how far they have come. They used to be chalky and disgusting; now, there are so many options, many of which taste great and are relatively good for you! When Cari from EcoTrek Fitness contacted me about reviewing her whole food bars, I was really excited. Give me anything with chocolate and I promise you I will try it. Cari sent me a box of each of her flavors to try: Chocolate Raspberry and Chocolate Peanut Butter. 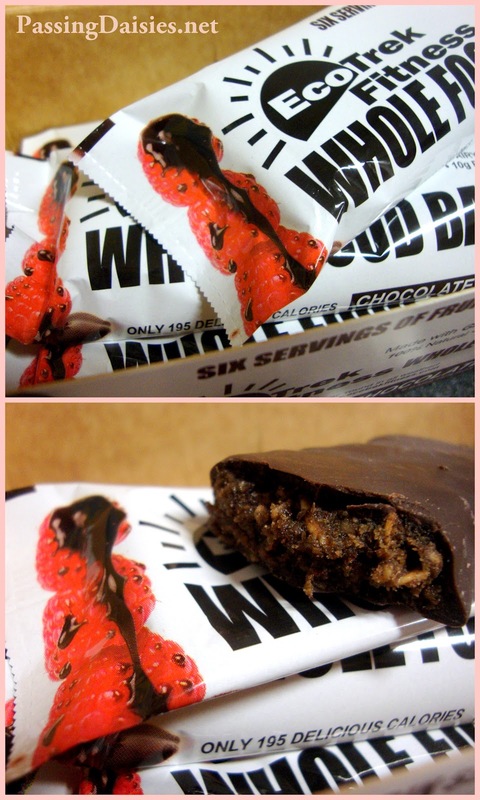 Each bar has 6 servings of fruits and vegetables (crazy!) and 10 grams of protein. My only complaint is that they also have 14 grams of sugar, which is the equivalent of a candy bar, but as long as you watch your daily sugar intake you should be fine. 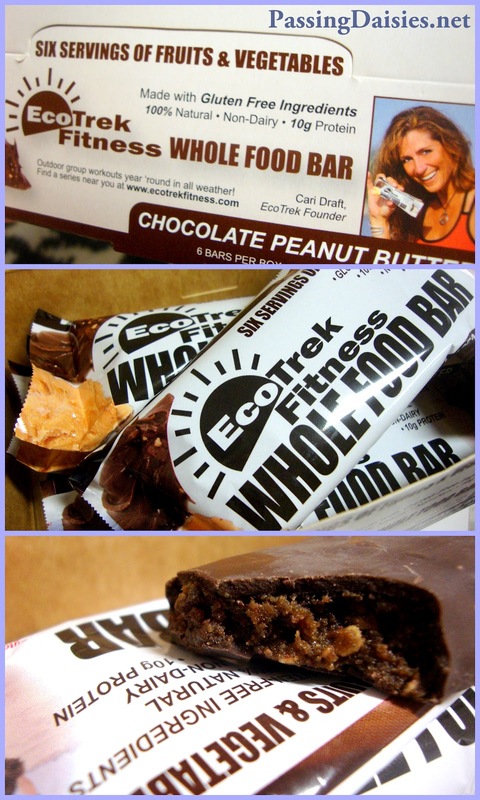 These bars are a healthy indulgence and a much better alternative to candy bars! First up: Chocolate Peanut Butter. These were pretty delicious. I honestly am always skeptical about trying new protein bars because I'm scared they will taste like chalk, but these tasted like a candy bar. A much healthier alternative to Reese Cups. Chewy, chocolatey, and fudgey with some crunch. Next: Chocolate Raspberry. These were by far my favorite! I love the combination of chocolate and fruit, especially dark chocolate and raspberries. This reminds me of the Chocolate Raspberry Lunabar, although I couldn't tell you which was better unless I compared them side by side. This has a strong raspberry flavor that I cannot get enough of. I could devour the entire box in minutes. Seriously. I could. So, aside from the bars' high sugar content, these are great. Want to win a box of your own? 1. MANDATORY- Tell me what your favorite protein bar is, if you have one! 5. Follow me on Pinterest & repin something from the board "Passing Daisies"
Tons of ways for you to enter, so get entering! The giveaway will end on March 13 at 11:59PM EST and the winners will be announced in the following day's WIAW post. I'm following you on pinterest + i repinned one of your pins! I already "like" Passing Daisies on facebook! I am following your blog via google reader! My favorites so far are Vega bars, but I'm always willing to try something new! Cheers! I like PD on facebook! i follow you and cari on twitter! I followed you on Pinterest and repinned your Lemon Loaf! Mmm! OooOOo, the chocolate raspberry sounds so delish, and I've had the luna choco raspberry bar before and it is good! My favorite protein bar as of right now is Clif builder's bar. I usually only eat half at a time because they are HUmungo, but they are super tasty and satisfying. Follow Cari Draft [EcoTrek Fitness] and you on Twitter! Following on Pinterest and I believe I repined something in the "Future Kitchen" board. Currently my favorite protein bar is probars. I love how I can taste all the different ingredients in it, and that they use whole foods! Following you and ecotrek fitness on twitter. I'm subscribed to you by email. I really like think thin bars! 20g of protein, no sugar, and awesome flavors.